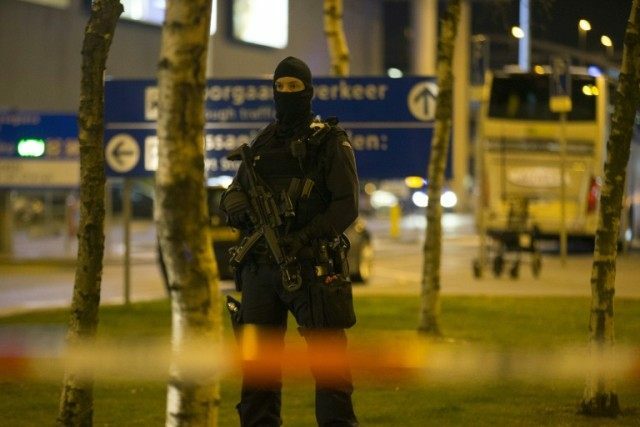 The Hague (AFP) – Military police Wednesday probed a major security alert at Amsterdam’s busy international airport, with one man still in custody in a jolt to Dutch authorities, three weeks after attacks in Belgium killed 32 people. Dozens of heavily-armed military police swarmed Schiphol airport late Tuesday, partially evacuating parts of the public areas and arresting one suspect. The operation was triggered after a tip-off from a bystander about an unspecified “suspicious situation”, a military police spokesman said. “The man remains in custody and the investigation continues,” Alfred Ellwanger told AFP on Wednesday, refusing to reveal any details of the suspect’s identity. “The situation at the airport has returned to normal,” he added and the airport’s authorities confirmed no disruptions were expected on Wednesday. The scare at one of Europe’s busiest travel hubs, with flight links to 319 destinations around the world, came exactly three weeks after the March 22 attacks on the Brussels airport and metro left 32 people dead and hundreds wounded. The Netherlands tightened security and stepped up border controls in the wake of the suicide bombings in its southern neighbour, which also followed the coordinated attacks in Paris in November. But it remained unclear Wednesday exactly what was behind the late-night security sweep at Schiphol, after the Dutch bomb squad found nothing suspicious in the arrested man’s luggage. Tensions have been high since last month’s attacks in Belgium, which like the Paris attacks in which 130 people died, were claimed by the Islamic State (IS) jihadist group. There have been concerns that the Netherlands could be targeted in a terror attack, due to its proximity to both Belgium and France, and its role in the US-led bombing campaign against IS in Iraq and Syria. Schiphol is Europe’s fourth-largest airport, and welcomes some 55 million passengers through its gates every year. No flights or train traffic were disrupted during Tuesday’s operation, which saw balaclava-clad and sub-machine gun-toting officers cordoning off a square at the entrance to the airport’s shopping plaza, which leads to the arrivals and departures halls. Hundreds of passengers, many of them on long-haul flights, waited for hours until the all-clear was given at around 1:30 am (2330 GMT) on Wednesday. Earlier, another scare was triggered at nearby Leiden station but police later said it was a false alarm. Dutch F-16 fighter jets have broadened the country’s mission in the US-led air campaign against IS, bombing jihadist targets in Syria since February. More than 200 Dutch nationals, including about 50 women, are also believed to have joined the ranks of IS in Iraq and Syria, according to Dutch intelligence services. Last month, at the request of French authorities, Dutch police carried out raids on an apartment in Rotterdam, uncovering about 45 kilos (99 pounds) of ammunition. French suspect Anis Bahri was arrested at the flat suspected of trying to take part in a foiled plot in France. He is now fighting his extradition to Paris. Investigators have uncovered extensive links between the Paris and Brussels attacks, with many of the same people involved. Adding to the jitters in The Netherlands, one of the suicide bombers in Brussels, Ibrahim El Bakraoui, was found to have been expelled from Turkey to the Netherlands last year, before he slipped back across the border to Belgium.